Have you invested a lot of time in your email marketing campaign and have not received the results as desired? It is obvious that you are now looking for certain truly helpful tips and strategies which will provide you better email marketing results. Don’t worry; you have now landed on the right page where you will get the best tips for better email marketing results. Email marketing method ranks on top of all the marketing tools since it is affordable and very effective. It keeps the prospects in the sales funnel and you can convert them into paying customers. 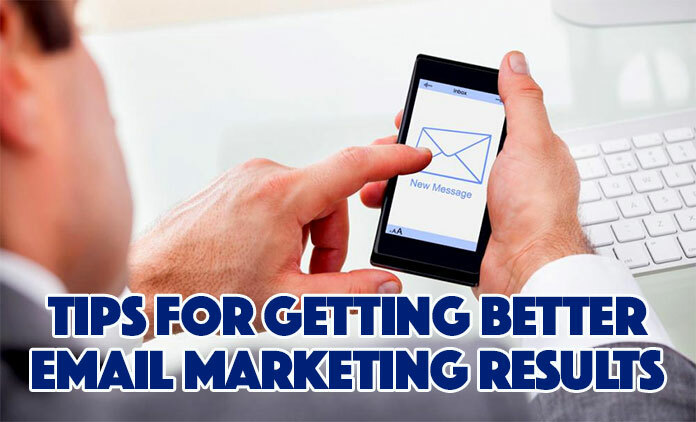 But, in order to get the results as expected or more, you need to consider some useful tips and strategies which will make your email campaigns worth and providing tangible outcomes. When an email user opens his inbox, the name of the sender is the first thing, he or she looks. If the sender’s name looks irrelevant or spammy to a recipient, the first thing he will do is to mark the email as spam. Statistics show that 43 percent of email recipients just mark a message as spam based on the name of the sender only. The best solution is to avoid being too creative. Just take the name of your usual brand name which represents your business best. In order to create a more personal feeling, use the name of a marketing representative with the brand name. If the email address you have used is a no-reply email address, it can create an impression that your business is not interested in hearing from their customers or prospects. The replies from the prospective customers should be encouraged and direct communication with them should be made. In many cases, just the mere ability to get replies can turn your dissatisfied customers into a completely satisfied customer from your brand. Although the name of the sender matters, subject lines matter even more than that. Nearly 69 percent of the recipients report emails as spam based on the subject line texts only. The most important point is that your subject line should summarise the content of your email I a single line and it is made sure that what you delivering, you promise. Do everything possible to avoid triggering the spam filters. These days spam filters are very powerful and they deploy a number of filtering rules which are required to be followed in order to keep your email out of spam box. Don’t use All-caps in Subject lines. Buy, Opportunity, Affordable, Cheap, Cash, Order, Save Money, Save up to, Urgent, No fees, Free, Guarantee, Discount, Percent Off, Incredible Deals and more. Emails should be simple and presenting too much information can create indecisiveness. Focus on a low number of offers with more personalization is always better. Email format also needs to be simple. A template with one big image, a little text and the main call to action is just enough. A limited-time offer creates a sense of urgency and therefore the recipients respond quickly to your email. The element of urgency should also be a part of your subject line. To increase the impact of email marketing, you should add a social advertisement campaign like a Facebook Ad campaign. The recipients who receive both emails and a coordinated social Ad campaign will convert more. A US retailer found that the recipients who receive both emails and social campaign like Facebook Ad were 22 percent more likely to purchase the item which was sold. Don’t miss any holiday or event! Every season, even or a holiday brings a great potential for sales and your email marketing campaign should never miss that. You should be prepared with newsletters pertaining to different holidays, seasons and events. Remember! If you wait too long, your customers are ready. So, don’t be upset if you are not getting a response from your email campaigns as expected. Try out all these tips and strategies explained in this article. Trying out different strategies and understanding what works best for your email campaign is important. It is our sincere hope that trying the tips mentioned here will reward you with a better customer response and a good increase in the sales. Next articleHow To Make SEO For Search Engines Other Than Google?